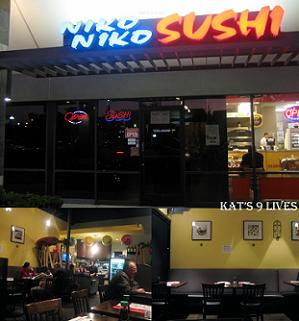 There are like 3 Niko Niko Sushi places within Costa Mesa and Irvine. Can we say overflow? TP mentioned that she really like this place but I guess the one near her. I found this location closer to South Coast Mall since it was close to where dinner will be at, the Hidden Kitchen. Thank goodness I came here for lunner or I would be even more disappointed with dinner! Niko Niko Sushi is located in a strip mall right across from the Vitamin Shoppe. They had your typical sushi decor with wooden tables. As soon as I sat down, they brought over some free Edamame that were run down and spewed from the shells a little. Miso soup also came with my meal. It was your typical bland soup and nothing special. I ordered some Hamachi Sushi to start but for some reason she heard Sashimi.... it's $1 more so I just overlooked it. Don't be tricked by my photo touch up! It was not this pretty of a color! I thought it didn't look too fresh because the coloring was off and dark... but after tasting it... the way it looked did not reflect its freshness. The Hamachi was decent and a fat odd slice. I don't know if you can tell, but it's pretty obvious that they have not mastered their knife skills. For the price, $5, I could have went to Mitsuwa and get a much better cut/chunk. I ordered their Bento box set because I was hungry and I didn't want to be too starving for 2nd dinner, just in case... which ended up being a smart plan! I got the 3 item for $12.50 but a lot of the choices were extra charge! 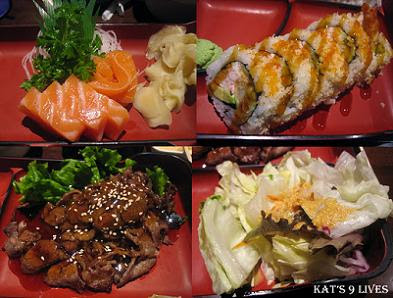 Of course I had to choose Sashimi, Beef Teriyaki, and Crunch Roll. The Sashimi was an extra $1.50 and I asked if could substitute the Maguro out for more Sake, Salmon. They didn't charge me an extra fee on top of that for the switch, which was nice or I wouldn't have chosen it. So I got 6 pieces of Salmon that was pretty fresh and had a soft texture, which is pretty easy to come by. I liked the Crunch Roll and the portion was pretty generous. There is not much rice around it. Instead it's filled with Imitation Crab *same as California Rolls*, Avocado, and Shrimp Tempura then rolled in Tempura Flakes. All in all this place is just another Americanized chain that I would think about going to when I need something to tide me over until I can get some good sushi when I have enough money. O=9 You pay for what you get! Still, this place is not cheap for their rolls and they have a plethora to choose from on the menu. Hence, why I chose the Bento box to tide me over until real dinner! If I do come back... I'd only get the Bento box and nothing else... everything else is not worth the value.